Tris Speaker is the all-time leader in doubles, with 792. In baseball, a double is a hit in which the batter advances to second base in one play, with neither the benefit of a fielding error nor another runner being put out on a fielder's choice. A batter may also be credited with a ground-rule double when a fair ball, after touching the ground, bounds into the stands or becomes lodged in a fence or scoreboard. 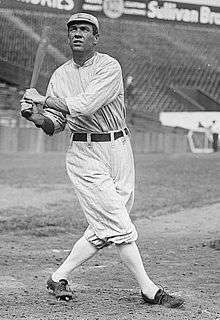 Hall of Fame center fielder Tris Speaker holds the Major League Baseball career doubles record with 792. Pete Rose is second with 746, the National League record. Speaker, Rose, Stan Musial (725), and Ty Cobb (724) are the only players with more than 700 doubles. Only doubles hit during the regular season are included in the totals (Derek Jeter holds the record in post-season doubles, with 32). Rank Rank amongst leaders in career doubles. A blank field indicates a tie. Stan Musial, 3rd all time in doubles. ↑ "Rule 10.06". Official Baseball Rules. Major League Baseball. ↑ "Rule 6.09(e)". Official Baseball Rules. Major League Baseball. 1 2 "Career Leaders & Records for Doubles". Baseball-Reference.com. Sports Reference LLC. ↑ "Historical Player Stats (sorted by doubles, NL only)". Major League Baseball. ↑ "All-time and Single-Season Playoffs Batting Leaders". Baseball-Reference.com. Sports Reference LLC.